Similar in nature and most commonly mistaken for a tornado, the waterspout is a unique weather phenomenon that occurs over a body of water. Warm water temperatures and high humidity much like a "dust devil" in that its formation is enhanced by unstable conditions, often create the waterspout in the first few thousand feet of the atmosphere above the sea surface. For this reason, waterspouts are most likely to occur near the coastline in summer, though occasionally some form as early as mid-spring or as late as mid-autumn. Waterspouts fall into two categories: Tornadic and Non-Tornadic. 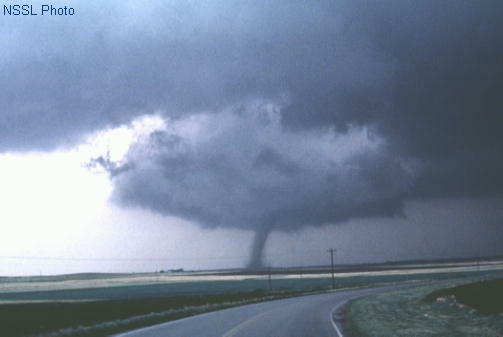 The "Non-Tornadic" fair-weather waterspout is comparable to a dust devil; it may rotate in either direction, whereas the "Tornadic" type of waterspout rotates cyclonically. In general, waterspouts are not as strong as tornadoes, in spite of the large moisture source and the reduced friction. The water surface under a waterspout is either raised or lowered, depending on whether it is affected more by the atmospheric pressure reduction or by the wind force. There is less inflow and upflow of air in a waterspout than in a tornado. The waterspout does not lift any significant amount of water from the surface. Ships passing through waterspouts have mostly encountered fresh water. Waterspouts are defined as an intense vertical column, or vortex, of low pressure that develops on the sea surface and extends upward to a cloud base, rather than descending down from the base of clouds, as is the case with a tornado. Occasionally, a waterspout occurs across interior sections of land when a tornado moves over a body of water such as a large lake. In such instances, waterspouts can be just as devastating as their tornado counterparts on land. Waterspouts have the potential to be extremely dangerous, with an average life cycle ranging from two to twenty minutes, as they travel at an average speed between ten and fifteen knots. Maximum wind speeds of hurricane force or greater, however briefly realised, can be expected. Meteorologists have been studying the formation of waterspouts for years. Technically an intense low-pressure vortex column, fair-weather waterspouts most frequently develop on the sea surface and then move skyward, rather than dropping down from parent clouds like tornadoes. Most are potentially lethal. Lasting from 2 to 20 minutes, they move at 10-15 knots, their intense vortices at maturity typically generating, however briefly, winds of hurricane force or greater. The funnels occur most frequently off the lee shores of continents in the tropics and sub-tropics such as Asia, Australia, and, notably, North America, particularly the Florida Keys where heated, humid air creates strong convective currents. Conditions are best when a high-temperature lapse rate (i.e. a rapid decrease of temperature with elevation) prevails at the sea surface during the warmest part of the day (usually around noon or early afternoon) and the winds are light and variable, with an extremely weak vertical wind shear. This kind of environment thermodynamically can support strong updrafts. In the Florida Keys, due to the unique geomorphology of the region, waterspouts spawn most frequently in the late afternoon or early evening. Research has determined that waterspouts are the end product of a number of interacting forms of motion that produce a cascade of energy. When a patch of air just above the sea surface becomes heated and rises, the resulting pressure differential causes the surrounding, slightly cooler, air to spiral inward, forming an eddy, much as a land-born dust devil. 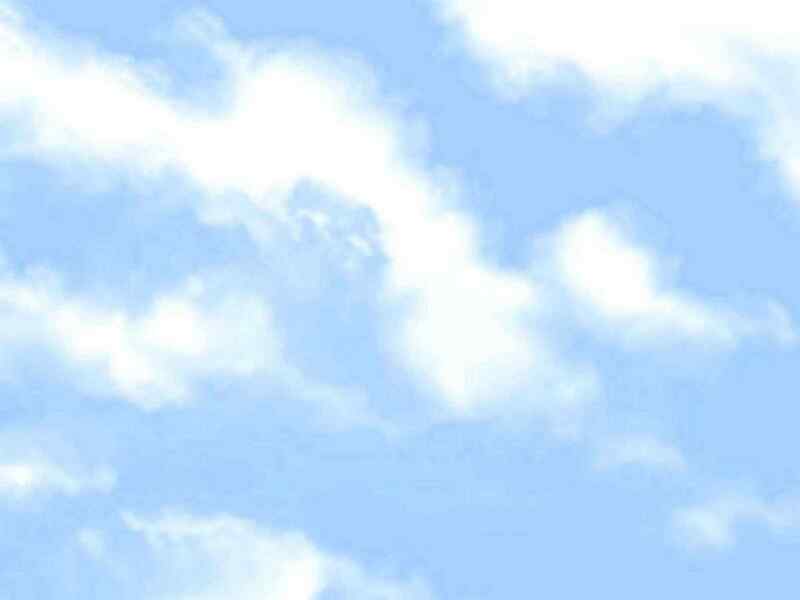 Over warm water, however, the abundant water vapour at the sea surface adds to the latent heat of condensation. And because water vapour is lighter than dry air, the steep water vapour gradient that is present helps carry the original spiralling eddy skyward. 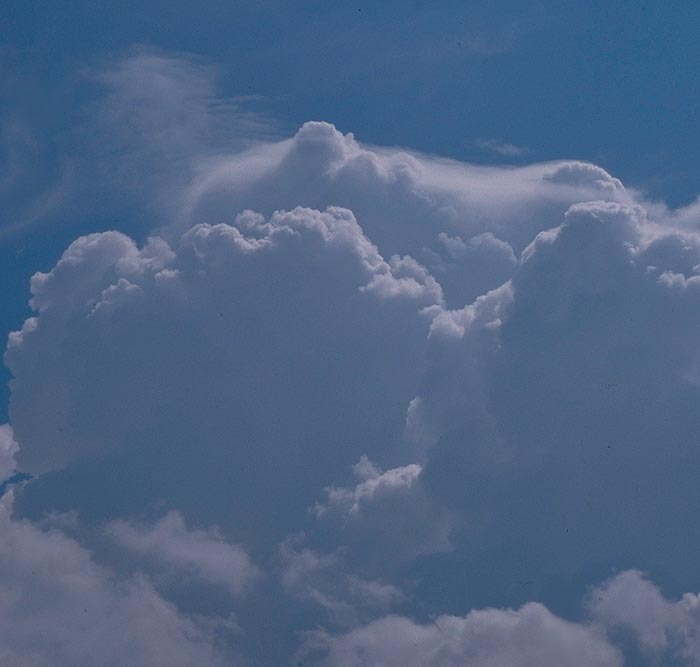 Though a parent cloud need not be directly overhead, there is always a cloud system or cloud mass nearby (usually cumulus congestus), coupled with strong convective air currents that frequently produce a downward moving funnel. 1: Dark spot.A prominent circular, light-colored disk appears on the surface, surrounded by a larger dark area of indeterminate shape and with diffused edges. 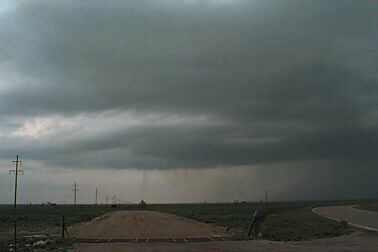 While not visible to the mariner at sea level, the presence of a dark spot and an associated funnel cloud overhead indicate that a complete funnel is present. 2: Spiral pattern. A pattern of light and dark-colored surface bands spiraling out from the dark spot develops. 3: Spray ring. A dense swirling annulus (ring) of sea spray, called a cascade, appears around the dark spot with what appears to be an eye similar to that seen in hurricanes. 4. Mature vortex: The waterspout, now visible from the sea surface to the overhead cloud mass, achieves maximum structure and intensity. Its funnel often appears hollow, with a surrounding shell of turbulent condensate. The spray vortex can rise to a height of several hundred feet or more and often creates a visible wake and an associated wave train as it moves. Although waterspouts are weaker than the strong tornadoes over land, they can be a real danger to boaters. One such notable incident occurred over San Antonio Bay in Texas, around noon on May 8, 1980. A waterspout destroyed a shrimp boat, then overturned and sank the craft. As a result of the potential hazards created by waterspouts, boaters and persons living along the coast should be aware of their destructive characteristics and be sure to seek safe shelter away from the path of the waterspout. Specifically designed NOAA weather radios are used to provide a continuous source of weather information to the public underlining that severe weather awareness is a major concern. 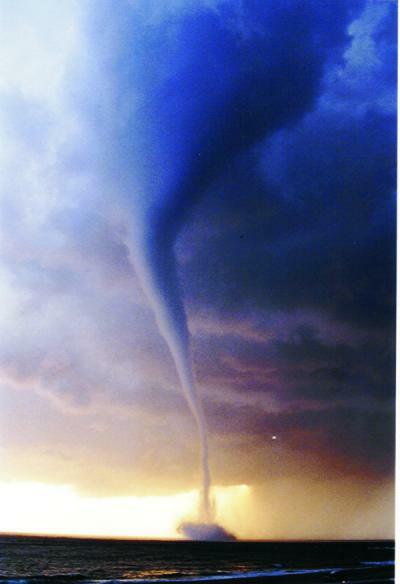 · Although classed Tornadic and Non-Tornadic, a waterspout is not a tornado over water. 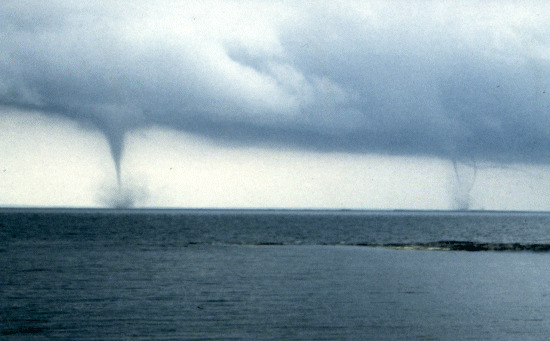 In the past, waterspouts were described as tornadoes over water. However, recent scientific research has provided us with a more complete but more complex picture. Waterspouts and tornadoes have similar basic structure with air spiraling upward. At the ground or ocean surface, winds accelerate as they swirl into a vertically oriented vortex. With both tornadoes and waterspouts, the vortex is only seen when the pressure inside drops enough to condense water vapour from the moist air producing tiny water droplets. 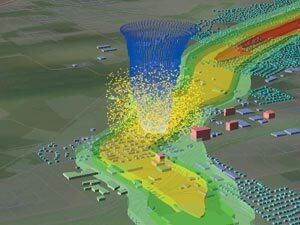 In both systems, damaging wind actually occurs at the surface before the visible portion (funnel cloud) of the vortex reaches the ground. · Waterspouts are most common along the Gulf Coast and southeastern US coastline. · Waterspouts are weak tornadoes that form over warm water and may occasionally move inland. As soon as the base of the rotating column of air moves over land the waterspout becomes a tornado! 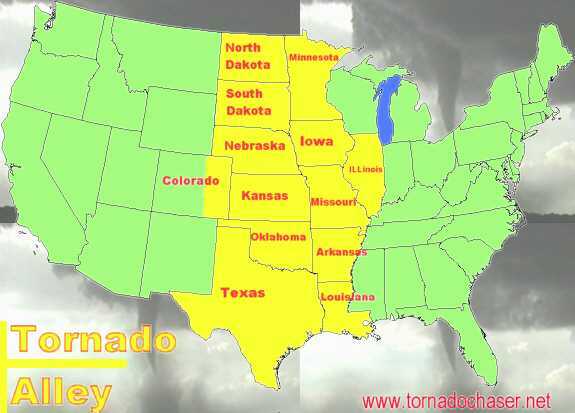 · In the western United States, waterspouts occur with cold late fall or late winter storms, at times when you least expect tornado development. 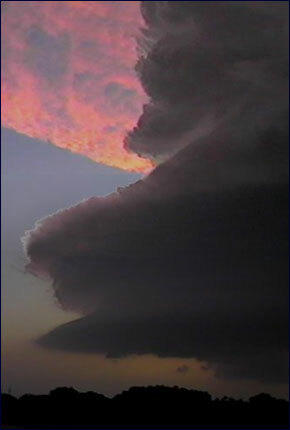 · Waterspouts form primarily from low-level convergence of unstable air. This convergence results in swirls near the surface, which become more intense as they are stretched vertically by growing clouds. They begin near the surface and grow upward. 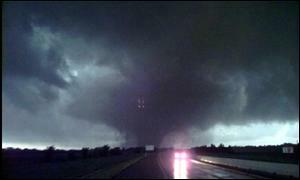 Tornadoes form from a "mesocyclone," large rotating thunderstorm, with roots in the middle levels of the atmosphere and grow downward to the surface.